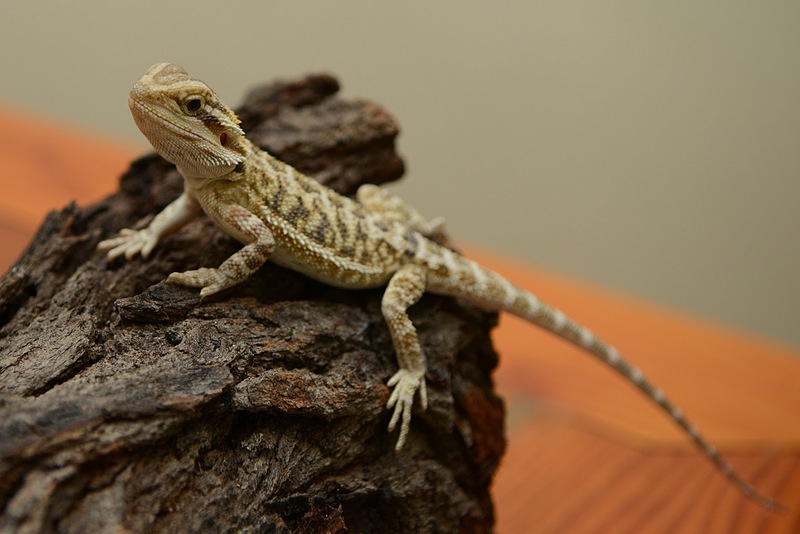 Small Animal Talk: Lizard medicine 101: How do you treat a sick bearded dragon? Lizard medicine 101: How do you treat a sick bearded dragon? This is Jet, a baby bearded dragon. 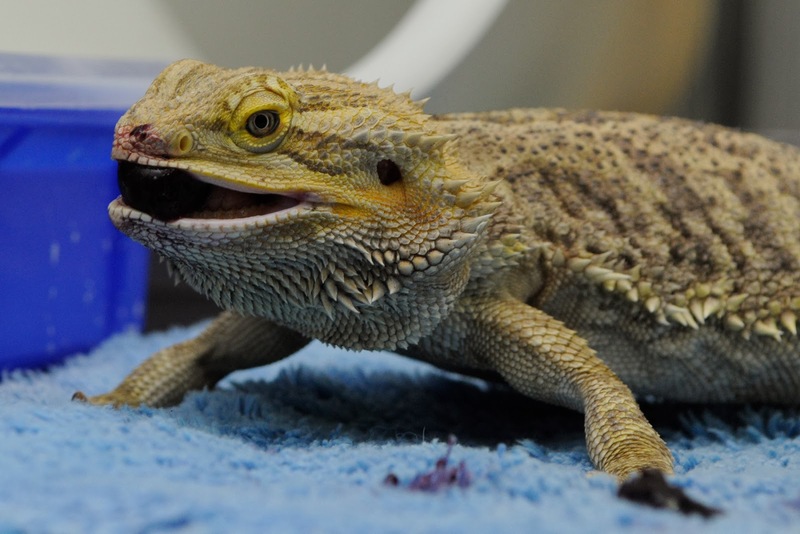 I recently attended a webinar by Dr Robert Johnson, co-owner of South Penrith Veterinary Clinic, on Lizard Medicine 101, which provided some excellent tips on the care of lizards, particularly bearded dragons. If you’re not convinced you need to learn anything about beardies, consider a 2011 study which found that a study in 2011 found Bearded dragons are the most common pet lizard in the UK and they are eclipsing pet birds in terms of popularity. The most common species kept as pets in Australia are the coastal or Eastern bearded dragon (Pogona barbata), the central or inland bearded dragon (Pogona vitticeps) and the pygmy bearded dragon (Pogona henrylawsoni). Eastern beardies are not such good indoor pets. Lizards need a good source of UVB light on a daylight/night cycle. UV lights have a limited life such that they get to a point where they stop emitting UVB – so they need to be replaced every 6-12 months, or tested. Sunshine is vital to the health of any diurnal lizard and 20 minutes of bright summer sun can be worth 12 hours of artificial UV light. And, as Dr Johnson says, it’s free. They need a thermal gradient in their preferred optimal temperature zone. For beardies, one area of the enclosure may be as warm as 35 degrees – they just need to be able to move in and out of the warmer zones. Reptiles need environmental enrichment too. They like to dig in sand, especially females – and some of these ladies won’t lay eggs unless a suitable sand pit is available. Nomming a blueberry. Note stains on his face. Beardies need a good diet. Young beardies eat mostly crickets and cockroaches – but these need to be healthy looking and they need to be fed too. If you keep too many crickets in a small enclosure they will eat each other. Mature beardies are omnivores and will eat fruit, vegies, flowers and insects – and they love dandelions. Hospitalised beardies should be offered greens daily, insects every few days and (if they are quite unwell) a 50:50 combination of Hills a/d diet with Oxbow Critical Care formula. According to Dr Johnson, lizards should have good muscle tone, proud stance (pushing their chest off table), and should respond positively to touch. 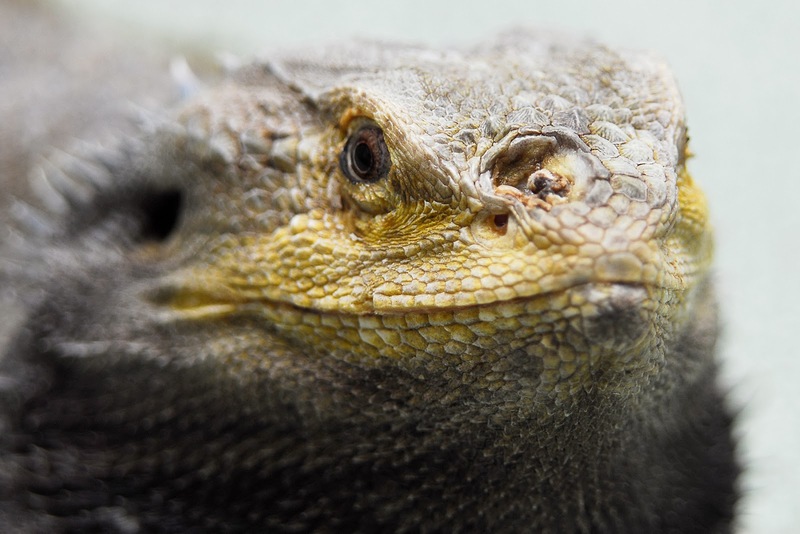 The most common ailment seen in captive bearded dragons is metabolic bone disease (MBD), which occurs due to insufficient calcium, insufficient exposure to UVB light, overhandling or a combination of these. In the oral cavity, look for stomatitis, gingivitis/gingival recession, a rubber jaw which is a giveaway for MBD. In wild animals, you may see nematodes in the throat – these don’t necessarily require treatment. A bearded dragon with a nasty facial fistula. Unlike snakes, lizards shed their skin in pieces. The underlying, new skin is soft and free of blemishes. Mites not as common in beardies as in bluetongues and pythons. Ticks will often cause anaemia. Investigate crusts and ulcers. Ocular disease is not uncommon, but bilateral enlargement of the eyes, possibly due to engorgement of venous sinus around the eyes, is more common in animals with MBD. Dr Johnson went on to share his tips about in-house clinical pathology of lizards, sedation and anaesthesia and speying of females. 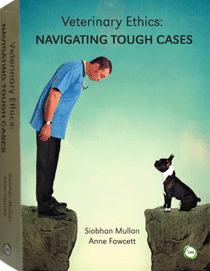 He and Brendan Carmel are co-authoring a fantastic book together on disease in reptiles. Read here for further information and download the flyer here.